07 December 2018 (Toronto, ON) - Stunning archive footage of Elton John’s festive classic “Step Into Christmas” has today been unveiled. The extremely rare performance footage was originally broadcast in 1973 as part of The Gilbert O’Sullivan Show and is a wonderful throwback sure to get everyone in the mood for the festive season ahead. After its original broadcast, the footage was lost in the ITV archives and has only recently been unearthed. 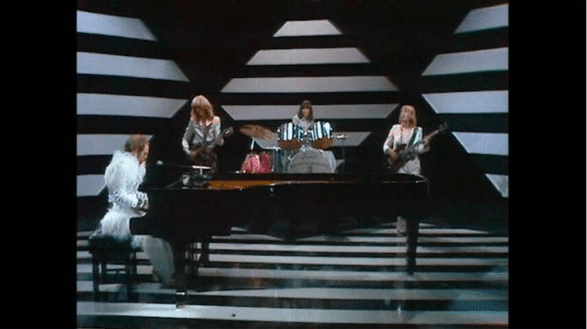 Featuring Elton alongside his classic band line up of Davey Johnstone, Dee Murray and Nigel Olsson (and a rare cameo from songwriting partner Bernie Taupin on percussion) it has not been seen since it was first aired in 1973. Last year, the original version of “Step Into Christmas” was re-released as part of the Deluxe Box Set Edition of Elton’s ‘Diamonds’ career retrospective and continues to solidify its place as one of the nations most loved and enduring Christmas songs. Its streaming figures have grown massively as new generations of fans discover the song’s magic, with figures in 2017 up 87% on the previous year. The single originally charted at No. 24 in the UK single charts, and continues to hit new highs, reaching a peak chart position of No. 11 in 2017. “Step Into Christmas” is available now as a three track digital EP featuring the original single audio, B-side of “Ho! Ho! Ho! (Who’d Be A Turkey At Christmas)” and the audio version from the Gilbert O’Sullivan Show.